In its first full race series since arriving in Australia, the stunning new J/112E ZEST finished an impressive 2nd overall in the Sydney Amateurs Sailing Club “Cruiser Racer series”. The full sixteen race series was held on stunning Sydney Harbour. Starting in September 2018 and finishing in mid-April 2019, the competitive fleet raced in a wide variety of wind and sea state conditions. From light drifters to 30 knots plus “blowing dogs off chains” kind of weather, the new J/112E handled everything in her stride, with an impressive score line of four 1sts, a 2nd, three 3rds, and a 4th. Rob Date and the crew from J/111 Scarlet Runner11 competed in 160nm Adelaide to Port Lincoln Race, followed by Teakle Classic Lincoln Week Regatta with 6 races over 4 days of racing at Port Lincoln. 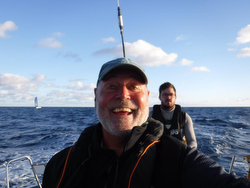 Rob’s J/111 home port is near Melbourne in Victoria, so the crew sailed the 550+nm trip to Adelaide against the predominant westerly ‘roaring 40s’ winds to compete in the regatta. The racing starts in the blue waters of the Gulf of St Vincent off Adelaide where 40 boats leave Outer Harbour/North Haven in Adelaide on Friday about 3.00pm to compete in the 160 nautical mile race. It is “South Australia’s Premier Ocean Race” and now in its 69th year complete with all the challenges of a Category 3 race. The route takes them south west to Marion Reef at the foot of York Peninsula along the foot to the spectacular Cape Spencer then North West past Wedge and Thistle Islands and Dangerous Reef to the welcome of Port Lincoln nestled on Boston Bay. The race started on a port beat for 35NM. The Scarlet Runner crew are in the most part inexperienced in Ocean Racing. Rob’s daughter and future son in law, his best mate for more than 40 years and the balance being the usual inshore race crew made 7 crew in total. After passing Marion Reef the course freed up. Scarlet Runner 11 put up the code zero and were doing 14knots with the occasional knock down. Unfortunately the zero did not last the distance. After passing the bottom of the York Peninsula SC11 were into VMG running as the pressure dropped. The final 20 NM was running under A1 and Scarlet Runner 11 achieved the fastest time for this section of the race. The distance race is then followed by Lincoln Regatta with a mix of inshore and coastal courses over 4 days that make the most of the fantastic sailing in Boston Bay and among some of the surrounding Islands. One race finishing at an isolated beach for a BBQ, drinks and beach cricket before the down hill sail back to the marina. Scarlet Runner 11 topped the Div 1 leader board at the Regatta scoring 1st on AMS (9points), 1st on PHS, and 2nd by just two points on IRC, a very impressive result considering the competition which included Farr 40, First 45, 47.7’s, Melges 32 and Sydney 38’s and Sydney 47. For J/121 JAVELIN, the event kicked off with a 32nm passage race from St Kilda in Melbourne, across Port Philip Bay to Geelong. Two start lines of 230+ boats set off at 9.30am in light 4-5 knot southeast winds. J/121 JAVELIN was in the first start of 100+ yachts of all shapes and sizes, including 32 yachts in the AMS 1 division. This division featured yachts from a pro’d up Soto 30, through a Caprice 40 (2nd in its IRC division in the recent Sydney/Hobart) all the way up to a Reichel Pugh 63 (3rd IRC overall in the Sydney/Hobart). J/121 JAVELIN was buried on the start but set to the task of reeling in the competition, with the strategy to keep slightly left of the course to take advantage of a forecast wind shift. JAVELIN flew their Code Zero most of the way (albeit it was hoisted and dropped half a dozen times along the way!). The last stretch passed through the tight shipping channel with the wind peaking at 16 knots, and JAVELIN sailing on a close reach. Their strategy worked and they finished 6th in their division in the passage race. Plenty of celebratory drinks accompanied the Australia Day fireworks display held at the Regatta Village. 3 further races were held over days 2 and 3, with 2 of those races having to race back through the shipping channel to open waters. This made for some spectacularly close racing where water rights dominated sailing rights. The fleet of 70+ yachts (up to 65 footers and including some big cats) worked together to get through relatively unscathed (though a few boats ventured a few metres outside the channel and ran aground). JAVELIN successfully tried a wing-on-wing strategy for a short while with the A2, managing to both gain clear air and separation from competitors. Conditions were pleasant once past the channel with flat water and breeze ranging 12-14 knots. JAVELIN finished 2nd in race 2. A twilight race was also held to take advantage of the stronger afternoon breeze, building to mid-20’s, though quite shifty. After a general recall, JAVELIN had a clean (and conservative) start, and powered over 10-12 yachts on a tight 2 sail reach. The A3 kite was hoisted at the top mark for what looked to be a beam reach. However, the wind shifted just after the hoist and the A2 would have been a better choice. JAVELIN maintained their position finishing 4th in Race 3. Going into the final day of racing, JAVELIN was in the lead position, with only a few points separating the first six yachts. She sailed a clean covering race in perfect sailing conditions- sunny, flat waters and 12-14 knot breeze. The results came in and JAVELIN finished 1st in Race 4 and, therefore was declared the overall winner in her AMS 1 class, finishing with 13 pts and convincingly won their division six points clear of the next boat. Congratulations to Mark and all the crew on their fantastic result. Over the Australia Day Long Weekend, the RGYC Festival of Sails hosted the 2019 J/111 Australian Nationals, with the 5 boat fleet sailing 8 W/L races on the gorgeous Corio Bay. A great time was had by all as the sailing conditions were near perfect on the flat waters of Corio Bay, with winds ranging from 8-22knots and clear blue skies. All the crews commented on the fantastic close racing, with one crew commenting they were so close at times that you could throw a tennis ball to the each other. From the very beginning, Rod Warren’s very talented team aboard JOUST threw down the gauntlet by winning the first race. They never looked back, winning four more races over the three days and having to toss a 2nd place to win with a perfect score of 5 pts in 5 races! Meanwhile, there was a real battle for the balance of the podium with everything going down to the wire on the last day for the two contenders- Phil Simpfendorfer’s VELOCE and Rob Date’s SCARLET RUNNER. After the dust cleared from the battlefield, it was evident Team VELOCE’s crew were up to the task, posting a 3-2-4-2-1-4 for 12 pts net to take the silver. Rounding out the podium to take the bronze was SCARLET RUNNER with a 2-3-2-5-5-3 tally for 15 pts net, followed by PLAYLIST and JAKE. Click the image for some great footage from Festival of Sails of the J/111 fleet racing at Geelong. (Geelong, Vic, Australia)- A fleet of more than 270 boats will compete in the 2019 Festival of Sails, Australia’s biggest celebration of sailing, which kicks off with the 176th Passage Race from Melbourne to Geelong on Australia Day. The regatta runs from January 26th to 28th and is hosted by the Royal Geelong Yacht Club. The event is concurrently hosting the 2019 J/111 Australian Nationals. The very competitive fleet includes Rod Warren’s JOUST, Stu Lyon’s JAKE, Matt Powell’s PLAYLIST, Rob Date’s SCARLETT RUNNER 11, and Phil Simpendorfer’s VELOCE. Meanwhile, sailing in the offshore, random-leg, handicap racing divisions will be a number of other J/Crews. In the AMS Cruising Division is the new J/121 JAVELIN. She was newly commissioned this year and is based in Mornington. The crew has steadily optimized their performance and is proud to be the recent winners of the ORCV 2018 Winter Series. Skipper/ owner Mark Nicholson and crew will have their hands full taking on many of Australia’s best offshore teams. Tens of thousands of people are expected to flock to the Geelong waterfront over the Australia Day long weekend. Complementing the sailing is the Waterfront Festival, presented by Geelong Connected Communities, which will provide visitors with a smorgasbord of activities, live music and the Regional Artisan Fair, showcasing local produce. The Royal Australian Airforce’s elite formation aerobatic display team, the “Roulettes”, will also make a stunning return to Geelong. They will perform a breathtaking 15 minute aerial display in their PC-9/A aircraft, over the Royal Geelong Yacht Club and Eastern Beach Reserve, from 1pm on January 26. The Royal Australian Navy Band, one of Australia’s most widely recognized military bands, will also entertain crowds on Australia Day, with two sets starting at 12:30pm, from the Eastern Beach Reserve stage. A fireworks display, proudly sponsored by AirAsia, will be held at 9.15pm on Australia Day. The best vantage points will be from Eastern Beach Reserve and Ritchie Boulevard. Within 3 days of the Paris Boat Show, the NEW J/99 was delivered to the UK, fully commissioned including keel, rudder, rigging, electronics and sails, launched and sailed for the first time in 20+knots! The sailing performance exceeded expectations, the new J/99 is a blast. Here are a selection of photos from the first sail…. For the first time this year, Sailing Today teamed up with presenting partner MUSTO and sister magazine Yachts & Yachting to bring you the British Yachting Awards, truly a celebration of every aspect of the sailing world – from Caribbean cruising to high tech racing. In the Performance Yacht Category, there were over a dozen boats under consideration. The sailing public voted in the United Kingdom and winning the Performance Yacht Category was the J/121 offshore speedster! Here is what Y&Y/ Sailing Today had to say about the J/121. 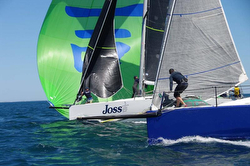 “J/Boats reckons its J/121 is the best short-handed racer the company has built. The 40-footer is designed to be sailed by five or fewer crew, which J reckon- and we agree- makes life a whole lot easier for racing skippers fed-up with rounding up 8 or 10 bodies every time they want to compete. She looks the part too, boasting low, sleek lines and an easy to use cockpit with everything at hand- features that clearly proved popular with voters. There is an 840-litre water ballast system built-in to compensate for extra crew bodies lined-up along the rail, and the low drag hull offers straight-line speed with high form stability. There’s a standard suite of five sails plus the usual J/Boats retractable bowsprit, and thanks to a comfortable fit-out down below, the J/121 is an ocean-capable racer that also functions beautifully as an adventurous daysailer, weekender, or fast cruiser. Ian Clyne’s J/122 JOSS recently won the 140.0nm 2018 West Coaster Ocean Race off Perth, Western Australia. Here is the report from Tony Bewsher, crewing aboard the J/122 JOSS. “A very competitive fleet took part in the West Coaster 140nm overnight race on the weekend of the 24/25 November, including our J/122 JOSS. The course was westerly from Fremantle, around Cape Vlamingh (the western end of Rottnest Island), then a 65.0nm northwards leg to a virtual mark set just of the historic coastal fishing town of Lancelin, and finally back south to the finish in Fremantle. The race started in 8-10 knots SSW winds with the fleet jostling for position on the 1.0nm upwind beat to the first mark. JOSS rounded in 3rd position behind “Dirty Deeds” & “Weapon of Choice”, then the fleet sailed off on a broad reach out to the Western Windmills Fairway mark off the SE corner of Rottnest Island followed by an upwind beat in a dropping breeze along the south side of the island to Cape Vlamingh (the most westerly tip of the island and extremely exposed to the full forces of the Indian Ocean). As the fleet approached Cape Vlamingh, the winds almost dropped out completely, making the rounding a slow frustrating affair. With an ever-growing cloud line slowly building on the horizon, the fleet edged westwards in our search for stronger more consistent breeze. Big Sails help win big races, and as the clouds built overhead, the wind grew sufficiently for everyone to hoist their biggest spinnakers. JOSS hoisted our big “Bright Green” A1.5 Spinnaker for this 65.0nm downwind run. The wind built steadily throughout the afternoon to 15-18 knots. We found ourselves dueling all the way to the Lancelin mark with “Obsession” (Mat1180) and “Weapon of Choice” (FB35). We even managed to pass these higher IRC rated boats midway along the track, only to have them battle back to lead us by a few hundred metres around the virtual top mark off Lancelin at approx. 2100 hrs Saturday night. With a stunning full moon lighting up the ocean, we sailed for Fremantle in a more moderate breeze, maintaining contact with the 4 faster & lighter Div 1 yachts ahead of us. At sunrise we witnessed a beautiful Western Australian dawn with JOSS leading the fleet in both IRC & YAH, and eventually crossing the finish line at Fremantle at 0700 hrs Sunday morning in a time of 21:35:37. Our winning margin on IRC was an impressive 27 minutes to the second placed boat “Obsession”, and 45 minutes to the 3rd placed boat “Alfresco”. It was 22 hours of perfect sailing conditions for JOSS with fluctuating winds between 8-18 knots and moving from an early light southerly on Saturday morning, swinging west and building until sunset throughout Saturday, then moderating over night to finish in an easterly land breeze. The 140nm “WestCoaster” was a much more enjoyable sail compared to the recent similar distance overnight race, the “3 Ports Race” being knocked down 3 times during the night by 60-70 knot winds!!! In sailing, winning is often a combination of great sailing by the boat & crew, and an equal measure of the “sea gods smiling on you”. There were many smiles over this weekend. “Joss” has started the 2018/19 ORWA Offshore Season in strong form with 2 wins in Div 1 IRC, a 2nd, & a 5th, and 3 wins in Div 1 YAH & a 5th place.